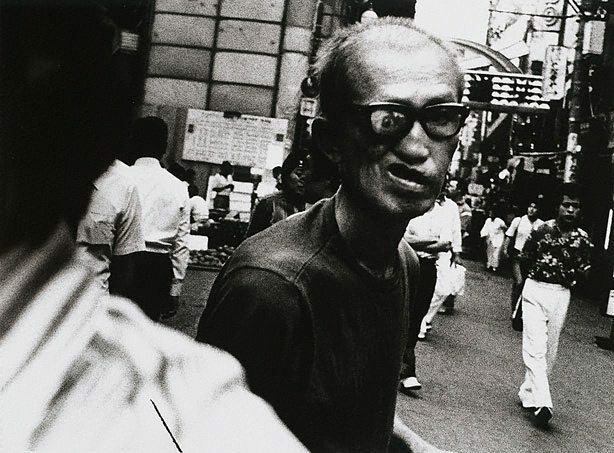 Daido Moriyama began his working life at the age of 20 as a graphic designer in Osaka. However the following year he embarked on the study of photography under Takeji Iwamiya and around this time he discovered the work of William Klein and Shomei Tomatsu. In 1961, Moriyama moved to Tokyo and became Eikoh Hosoe's assistant for 3 years, working on Hosoe's series with novelist Yukio Mishima, 'Ordeal by roses'. He was deeply influenced, however, by his regular contact with Tomatsu. By the mid 1960s Moriyama was publishing his photographs regularly and his dark, grainy, snapshot signature style was beginning to mature. In 1968 Moriyama's first major series 'Japan: a photo theatre' with text by theatre radical Shuji Terayama was published. Martyn Jolly, Photography: Art Gallery of New South Wales Collection , 'International photo-documentary', pg.151-167, Sydney, 2007, 154 (illus. ), 166 (illus.). Jane Somerville, Look , 'The familiar made strange', Sydney, May 2007, 19 (illus.). 21st century prints , Autumn 1997. Inu no toki (Dog days) Moriyama Daido , 1995. Camera mainichi , Sep 1982.